A missal provides all the prayers, hymns, and readings necessary for the celebration of Mass over the course of the year. 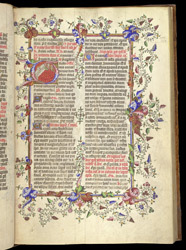 This deluxe 15th-century missal made for use on the altar was given to the church of St Lawrence in London by William Melreth, alderman, textile merchant of Broad Street and eventually member of Parliament, probably just before he served as Sheriff of London. Two calendars run side-by-side for church services. One calendar (the temporale) is arranged around Christmas and Easter (Advent, Lent, Pentecost). The other is a calendar of dates on which saints and some events are remembered (the sanctorale). The feasts celebrating events in the life of the Virgin tend to be of major importance in the sanctorale. In this missal, a beautiful border of richly modelled plant ornament embellished with gold expresses the importance of the feast of the birth of the Virgin. A historiated initial begins the feast's prayers, showing, from above, the Virgin's mother, St Anne, lying comfortably in a large bed under a red cover as a midwife presents the infant Mary to her.